The world really is not big enough for dwarfs, ghouls, humans, and skeletons! 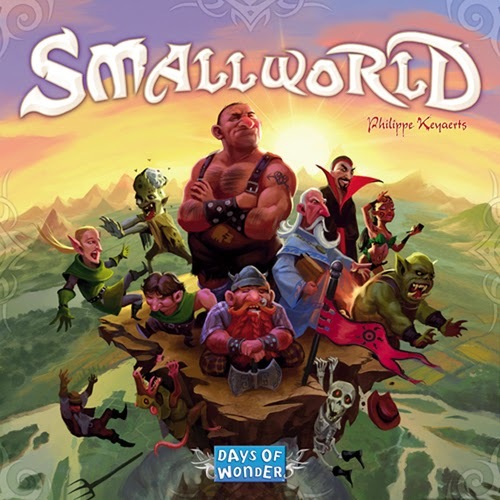 Smallworld features a world with 14 different races of creatures and 20 different power badges. They are mixed and matched randomly before each game. Players select a race and power badge combination from six available. Players then occupy terrain sections of the board by occupying vacant sections or overpowering races in the sections. After a couple of rounds players can put their race in decline and set themselves up to select a new race and power badge combination to re-enter the fray. Points are awarded for occupying terrain sections and for any bonus points granted by the race or power badge they have in play. Players will have the opportunity to use several race and power badge combinations during a single game. Interestingly, Smallworld includes 2 double-sided boards. Each side of a board corresponds to the number of players - 2, 3, 4, or 5. We have an open copy of Small World available in our Demo Games Library for you come in and try.